ESense-Lab Ltd (ASX: ESE) is an Israeli-based R&D technology company. ESE has commercialised technology to reverse engineer the “terpene profile” of rare or valuable plants using natural alternatives. Terpenes are a phytochemical (natural compound) that define the scent and flavour of plants, forming a unique profile when combined. Initially, eSense-Lab will focus on terpene profiles for cannabis used in e-liquids. Reconstructed profiles exclude ‘cannabinoids’ and are therefore not subject to the same regulations as cannabis. The company intend to target other plants and spices used across a wide range of applications (cosmetics, household goods, food and beverages). The primary market for ESE’s technology is e-cigarettes and e-liquids. Patented in 2003, e-cigarettes have experienced prolific growth. Global sales have grown from approximately US$500m in 2009, to US$3bn per year in 2013, and then US$7.5bn in 2015. In the US alone, the e-cigarette market is anticipated to surpass $10bn in 2017. Meanwhile, e-liquid products accounted for €1.34bn in sales throughout Europe, Africa and the Middle-East in 2015. Consumption of cannabis through e-cigarettes is believed to be low due to cannabinoids being “poorly soluble in e-liquids”. 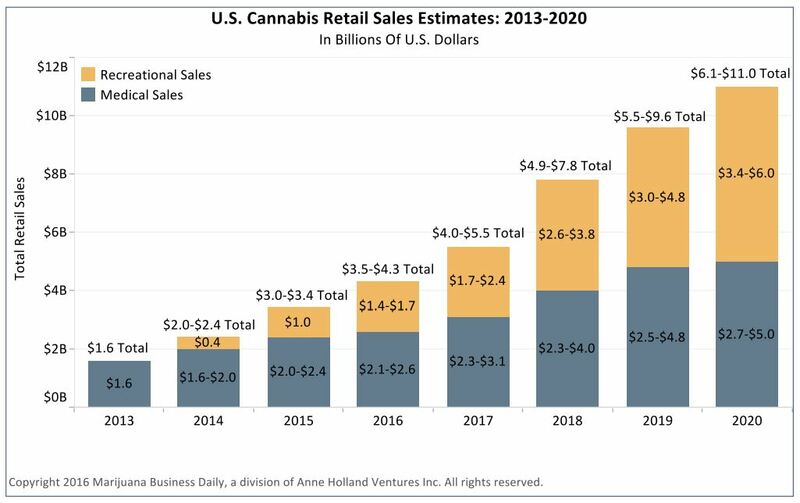 The US retail market for cannabis is forecast to grow from US$4.0-5.5bn in 2017, up to US$11bn by 2020. Total recreational demand for cannabis in the US is estimated between US$40-45bn, exceeding sales for markets like wine, organic food, and craft beer. ESense-Lab will target markets for alcohol, beverages, edibles, household goods, cosmetics, pharmaceuticals, therapeutics, topical creams and essential oils – globally, essential oils are “growing at over 10% annually” and “estimated at US$6 billion in 2015”. ESE is raising $3.5m via 17.5m CDIs at $0.20 – each equivalent to one share. The company will use the funds to: enable commercial production; conduct further R&D into other terpene profiles and products; develop the business and implement its strategy by securing customers, distributors and licensees. ESense-Lab develop reconstructed terpene profiles using 100% natural and organic materials. These mirror the chemical composition and qualities of a target plant with 99.9% accuracy. Preformulation: Analysis of the target plant’s chemical compounds to characterise its properties. Parameters are developed as a QC measure to guide formulation. Formulation: Software is used to model the interaction between chemical compounds. 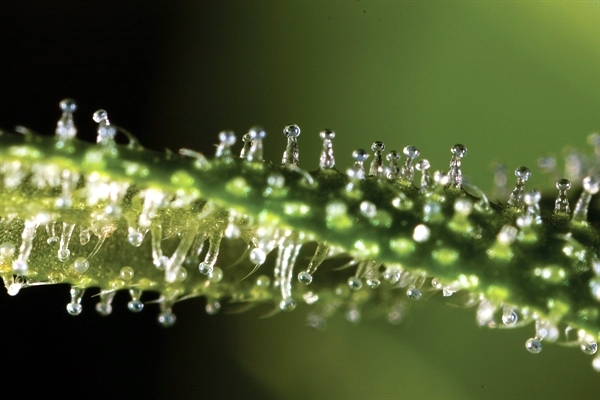 Reconstruction: Individual base terpenes are acquired from US and European producers. They are refined, validated and combined to form a terpene profile ready for distribution. Initial orders will rely on the services of Herbal Remedies Laboratories Ltd – a leading Israeli company involved with pharmaceuticals. With preformulation and formulation completed in-house, ESE are afforded control, efficiency, reliability and quality. Production is made-to-order, with capacity for over 100 litres per day from a single plant. In the future, ESE intend to manufacture in-house. This includes the option to independently or jointly develop its own products that include reconstructed terpene profiles. ESE has secured its first commercial order for cannabis terpene profiles, from Allor Vaporizers – a US-based electronic vaporizer business. The order, valued at US$470,000 (approx. US$20,000 per litre), is expected to be fulfilled by April 2017. Dr. Brendan de Kauwe Chairman and Non-Executive Director Director of Otsana Capital; significant IPO/RTO experience. Extensive tech, science and biomedical background. Various Director roles with ASX companies including RAC & OOK. $85,000 p.a. Mr Haim Cohen CEO & Director Managerial experience with public & private businesses across real estate, transport comms, HR and information systems. US$150,000 p.a. Mr IIan Saad Non-Executive Director Distribution experience concerning IT, semiconductors & automation. CEO of a leading IT distributor in Israel. $50,000 p.a. Mr Eran Gilboa Non-Executive Director Various roles as CFO within tech, real estate, finance & media. Experience with M&A activity. $50,000 p.a. Ms Galit Assaf Non-Executive Director Various managerial and director roles with Israeli businesses and government, including CFO and acting/deputy CEO. $50,000 p.a. Mr Quentin Megson Non-Executive Director 25 years’ experience within Australia’s finance & management industry. Various ASX roles (CFO, GM HR, GM operations). $50,000 p.a. Several agreements are also in place with key staff for their technical, scientific and advisory roles – namely: Dr Yaron Penn; Dr Mira Carmeli-Weissberg; Prof. Zvi Vogel (refer: Prospectus 7.4). The capital structure of the business is illustrated in Figure 3. ESE nominate 63.63% of issued shares to be escrowed (undiluted basis), or 83.14% (fully diluted basis). Options and performance rights are expected to be escrowed 24 months from official quotation. 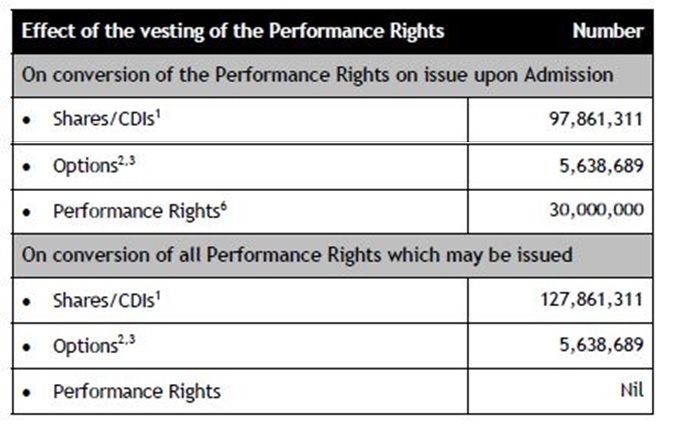 Performance rights may be executed in accordance with various milestones such as trading price, distribution contract value, and cumulative revenue (refer: Prospectus 9.4). 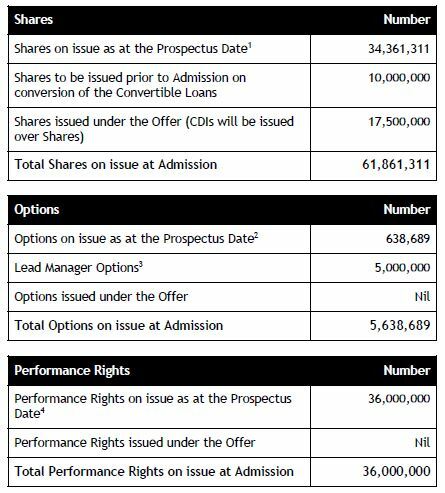 Otsana’s options may be exercised at $0.25, with a 36 month expiry from issue. 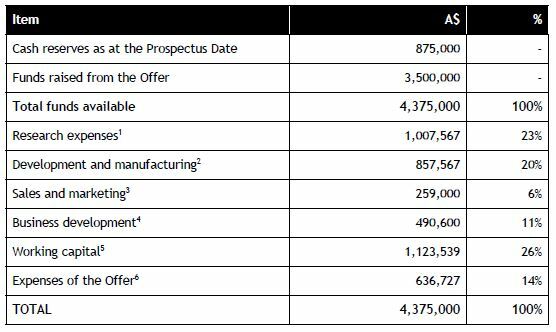 In November, ESE agreed to issue 1,110,689 incentive options. 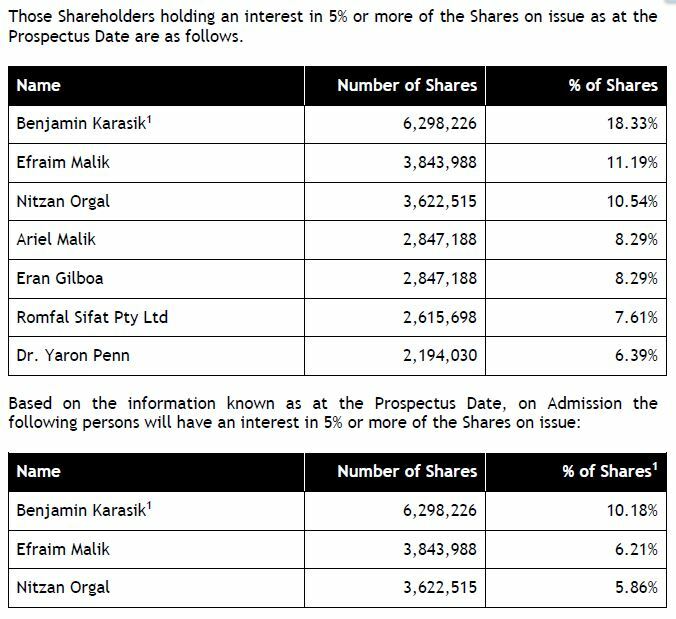 Directors were assigned 472,000 options and exercised them at NIS 0.01. The remaining options (638,689) were issued to Professor Zvi Vogel with the same exercise price. ESense-Lab signed a convertible loan for $1m with 27 investors, convertible into CDIs at $0.10. Figures 5 & 6 depict the director holdings and substantial shareholders. Incororated in April 2016, the company has a limited operating history. 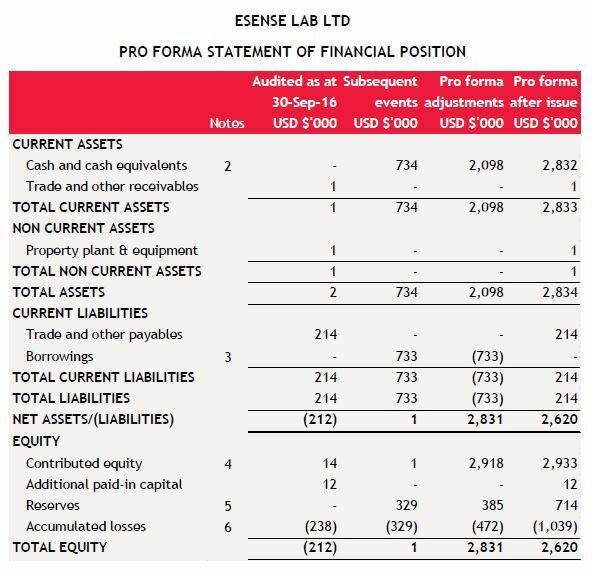 Since then, eSense-Lab recorded a loss of $238,000. The Directors have concluded they are currently unable to forecast earnings. Customers: Sufficient product demand has yet to be proven. Misperceptions around extracts vs reconstruction, and removing certain terpenes, could be a barrier. Contract cancellations could force alternative arrangements. Technology: IT or lab failures have the potential to materially impact ESE. New technology could impact revenue. Regulations: New or amended regulations could force eSense-Lab to revise its strategy. It is not guaranteed ESE will attain necessary approval(s), or pass necessary tests for future markets. Israeli-based Business: Political, economic and military factors. Differences in corporate law. Liquidity & Forex: A high portion of ESE’s shares are locked in escrow. The business operates across numerous jurisdictions with different currency.